Yesterday was my mom's birthday and this is the card I made for her. I used the "Vintage Vogue" set and the words are from the "Well Scripted" set. Both sets seem to go together SO well. The base of the card is white. 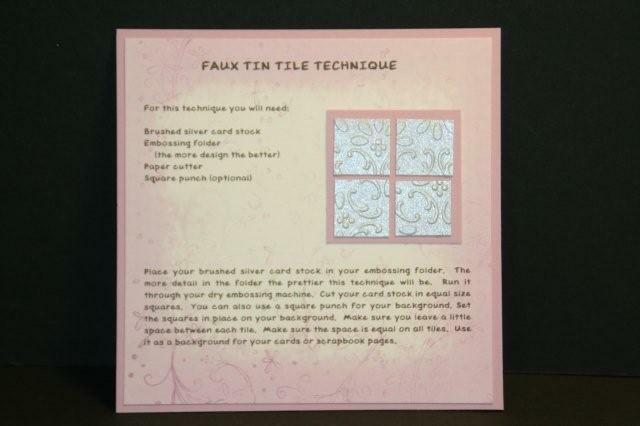 The next layer is a piece of Pretty in Pink that was textured with the Vintage" Wallpaper" embossing folder. On top of that is a piece of Pear Pizazz card stock that had the edges punched with "Pinked Hearts" punch. On top of that is a strip of decorative paper from the "Paisley Petals" package. The circle was from a giant 2-3/4" Paper Shaper punch that I had. I sponged the edges with Pretty in Pink ink and then I stamped the words on. I know!!! "How brave!" Normally I would stamp the words and then punch the circle. I had punched the circle to see if it was a good size to work with and I didn't want to waste it. Fortunately it worked out and I was able to use it. I tied a piece of ribbon around the decorative paper and attached it to the green card stock. The flowers were stamped on card stock and cut out individually. 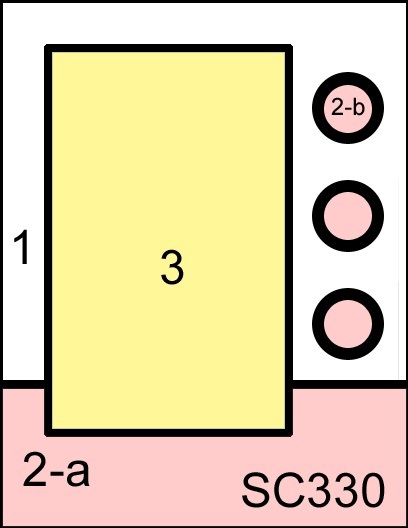 In the center of each one is a pearl. I thought about using the rhinestone but the flowers were just too "vintage" for them and thus the pearls went on. And I'm glad they did, I like them on there SO much better. It was a very fun card to make and I love these colors together! I LOVE to so to the Day to Day website. One day while I was surfing the site 10 year old Bella had a video tutorial on how to make hexagons (hexies). I figured if she could do this, well I could too. Though I have seen her crocheting and other projects and then I wondered if I really could do this. I decided to go ahead and give it a try. I printed out a hexagon for my pattern. You have to trace them on to cardboard. Now I think her idea of "cardboard" is different than yours or mine is. Oh, I forgot to mention that this site is from Australia. It looked like card stock to me so that is what I've been using. You cut out the hexagons (and trust me on this one, I tried to surf the net for a punch that would punch one out big enough but no luck. Someone could make a lot of money in the quilting business making one of those!!!). Once you have some cut out of card stock you cut your fabric a bit bigger than the pattern. 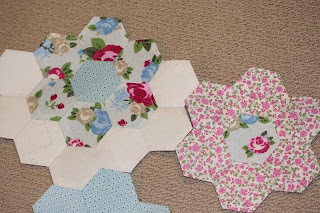 You then wrap the edge of the fabric around the hexagon and stitch it in place with long stitches. It goes really fast too. You don't need to be neat or straight with your stitching. When you get a few made then you can begin sewing them together or you can wait until you see how many you have and lay them out in a pattern. Be sure to watch the video, it's well done. Oh and I do love it when Bella gets those nervous giggles. It was cute!! I have a few more of the flowers done but I only took a photo of 3 of them. I have not played with them in a while but I am hoping to Saturday evening. We recorded the three "Toy Story" movies and I want to watch them but I can't just sit and watch a movie!! SO I will work on hexies until I can't do them anymore!! Then I'll probably bead a bit after that. I ordered more fabric so I wouldn't run out plus I did purchase some slightly off white fabric for around the flowers. It just looked TOO busy with all of the pattered fabric touching each other. I will show it to you when I am all done with that. PLEASE don't hold your breath though, it is not going to happen for a while. It will be like one of those "just when you forgot all about it" type things!! It will pop up on here and it will look BEAUTIFUL!!! Keep your fingers crossed on that one for me. Sewing and Wanda do not go well together! But this is hand sewing so it won't be as bad for me. The ends will be machine sewn but I don't have to concern myself about that right now. I have time to manipulate my older sister into helping me machine sew!!! LOL I'm sure it won't take as long as I'm thinking it will. I found a huge list of movies on NetFlix that I want to see so I will have some fun movie time and stitching ahead of me this summer!! I have been putting this card off all week and today I had to get it done for the viewing tonight. My uncle died on Easter Sunday. He had been ill for a while but was hanging in there. When he was taken off all of his meds he actually got better!! Imagine that??? Makes you wonder about the meds sometimes, doesn't it. But as time went on his body just couldn't hold out anymore and he slipped into a coma an was gone the next morning. I always had fond memories of him. He was a very nice man and will be missed. I made this card using the "Thoughts & Prayers" set. I copied this card from one I found on the Stampin' Connection web site at Stampin' Up!. It was designed by Lyssa. I liked it very much and thought it would be perfect for tonight. I did change the wording and it looks like it's crooked. I am going to stamp the words on a piece of white card stock and punch them out with the large oval punch, sponge the edges and tape it on top of the crooked words. I thought I lined it up right and I probably did, it could be mounted crooked. That sometimes happens too! And I also changed the bottom. Lyssa's card was a bit smaller at the bottom and the card stock was smooth. I use the Lattice embossing folder to add some texture to the card. I think it's a very pretty card and masculine enough too. K.C. seems to be doing a bit better today. I need to get a call into the vet to get an appointment to have him checked in about 10 days to see if the infection is cleared up. He is not liking the special diet food. But I think when he gets hungry enough he will eat it. He doesn't have much of a choice, I don't want him to get the crystals stuck again. Poor kitty. We have to go shopping this weekend for a pill popper (thank you Rita for the link) and we also need to get him some cat tooth paste and a cat tooth brush. I am not even going to think about doing that yet. I can't even begin to imagine how that is going to go over!!! Anyway, he seems to be feeling a bit better. He purred really loud when I brushed him this afternoon! That's a good sign! I really enjoyed this weeks Sketch Challenge over at SplitCoastStampers. I did flip the sketch so it would work with the images I wanted to use. 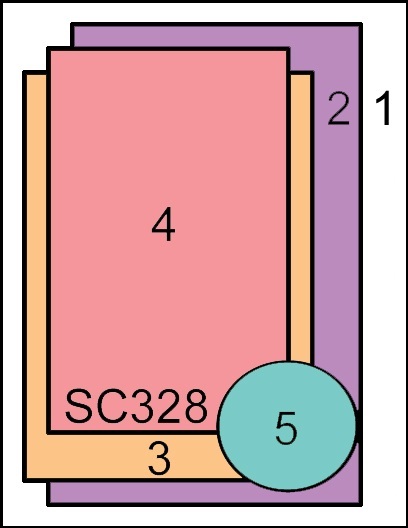 And that is perfectly ok. You just don't want to resize the spaces too much though. That is why it's called a challenge. You are given a sketch and you are to use it as it is as far as the elements go. I don't flip them too often but there are times when you have an idea in mind and you just have to turn the sketch! This was one of those times. Now as I look at the card I'm not sure what birds out of their cages has to do with a birthday??? Hmmm, what was I thinking? Oh well. Should anyone ever copy this card I'm sure they will come up with something better on the front than "happy birthday!" LOL I'm ok with it the way it is. I was just having fun with the layout and all of the colors! Not to mention the layers. You all know how much I LOVE layers. The most difficult part of this card for me was the 2-b pieces. I wanted to try to keep them small like in the sketch but I did end up making them just a bit bigger. Mostly because I didn't have any punches that tiny!!! SO, if you have time give this sketch a try. Flip it around any way you like too!! Try 4 cards from this sketch, one in each direction! I've never tried that before, it sounds like a fun challenge. But not today. I have a very sick cat to deal with. Ever have to give a cat a pill? And we are not talking a tiny little pill, this one is bigger than a pea. I didn't think a cat could swallow one that big. It's not fun either. We were told to wrap the cat up in a towel like a kitty taco and with your hand behind the ears you lean the head back and the jaw will open slightly. Really? K.C. 's jaw did not open at all. SO it took two of us to give him the pill. And just when we thought we were done holding his mouth shut, off to the side of his face is the pill. How did that get there? So once again the hand goes behind the ears, head leaning back, no jaw opening up. SO the other hand pries open the jaw and hubby pops the pill in. We close the jaw and pet him and tell him to swallow. We were told it could take a couple of minutes for him to swallow too. UGH!!! Finally he swallows and no pill on his face or the floor so we were happy!! K.C. not so happy. Oh and then we had to give him some pain meds too. It was liquid and all we had to do was get it in his mouth, it would be absorbed through his skin. Couldn't he just step in it?? Or sit on it??? That was a liquid so it wasn't as bad as the pill. Two weeks, twice a day with the pills. He's going to hate us by the end of the two weeks. And hopefully he will be feeling better. The poor guy has crystals in his bladder and he couldn't pee. It's a very serious thing and within 24 hours he could die. He was crying all afternoon and when hubby got home we took him in. He cried SO loud in the car. Hubby held him, we didn't think we could get him in the cat carrier. And as he held him K.C. was looking out the window and seeing all the things going by. I don't think he liked seeing light poles, cars and other thing whizzing by him. When he'd put his head down he was quieter. SO, don't look out the window then!! DUH! We were glad we got to bring him home tonight. When the Dr. was pushing oh his bladder to feel how full it was the blockage let loose and he shot a stream of urine out. Poor kitty! He's had this before and once they get this they will be prone to getting it again. I keep telling hubby, for a free cat he's cost us a LOT of money. But he's such a nice kitty and I don't want to lose him. I've added a photo of KC. 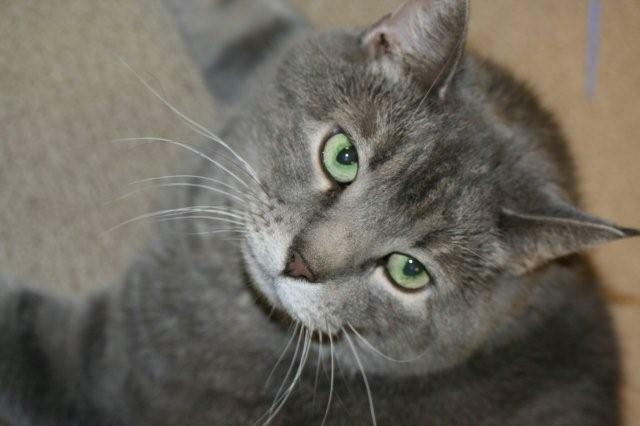 He is the most mellow cat you will ever meet. He loves it when you rub under his chin. When hubby is rubbing him under the chin and stops KC will take his paw and pull hubby's arm towards him so he can be rubbed some more!!! And when I hold him he will give me a kiss. I will say, "KC, give me a kiss" and he will rub his whiskers across my nose. And I will say "a nice kiss" and he will do it longer and slower!!! He's so smart! Anyway, I'm just happy he's on the mend. Once again I opened up "My Design Studio" and played with "The Open Sea" download. Adding to the ever growing list of the great things about downloads is that I can make it any size I want. Well, pretty much any size. Sometimes if you make things too big they will pixelate. Which means the image will look dotted, distorted or have a fuzzy look to it. Did you ever have a photo printed that was from an old camera and it came out fuzzy. Well, that is what pixelated. Pixels are the tiny dots that make up a photo or image. There's only so many of them in an image and when you stretch that image beyond the max you get a fuzzy mess! But shrinking the image down doesn't do that. But you can lose some of the finer details when making the image very tiny. I shrunk the ship down so it fit in a 1-1/4" round opening and there is still a LOT of detail in the image! I printed out a full sheet of them (about a dozen) so I can make some more of these tiny notebooks (they measure 2-1/2" x 1-2/"). They make great stocking stuffers and the do sell well at the craft fairs I've been in. And this year I will have more masculine notebooks when I put these in the basket for sale!!! It's always great to have little things for the guys stockings. As I look at these in the photo on here I am thinking the background could use a little something more. I'll have to work on that. I do like them as they are but maybe some textured card stock or using a texture folder will add a bit of pizazz to it! I think it just needs a little "something" else on the background! I love making these notebooks with my left over card stock and copier paper. I tend to print out a lot of things and when I'm done with them I will cut off 2-1/2" pieces for notebooks. And to think I use to toss those papers in the recycling bin. Now I recycle a bit of it before I toss them in the bin and make a little money on them too! I sell LOTS of these and the favorite seller is this cute kitty snowman. I'll be making that one sometime too and will post it on here. I was asked before if I will be selling them in my web store. Yes, I will put some in the store when I get them made. These ships are spoken for. I'm using these as gifts but later this fall I will be putting more ship ones together, along with other ones and I will let you all know when they come available. I know, some days I should just give the camera a rest!!! LOL I just couldn't help myself. There was this box of Peeps that I was going to use in a project. It was the "Peeps in a Jar" thing but I just didn't get around to it. SO what was I going to do with these bunnies? I had no use for them and I just couldn't toss them out without trying something. Well, this is the "something" I came up with!!! I actually bit the ear off and set it in the box. I got to thinking and wondering why I don't like Peeps. These are one of those things that either you like them or you don't. As a child I decided I didn't like them but as an adult I don't remember why. SO I ate the ear, sort of. I did spit it out. I'm not a big fan of marshmallows. Maybe if it were roasted over an open flame and put between a graham cracker and chocolate??? 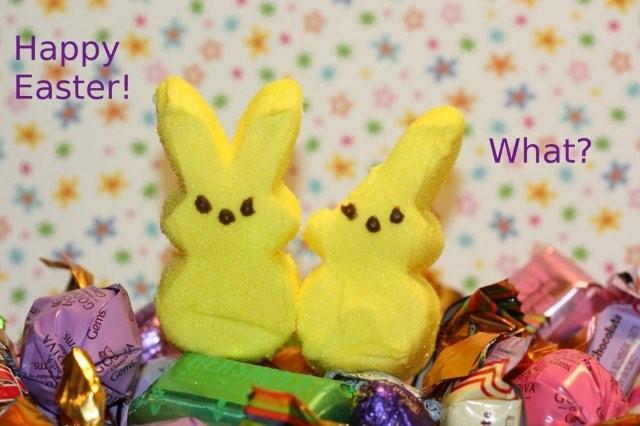 LOL Just don't care for marshmallows so Peeps are off the list of fun foods!!! I need a break!!! And on that note I am going to take one. There will be no cards or projects posted today. I am taking a break for a day. Just a break from my craft room. I will be working on making dinner and picking up the house for our guests. There's not all that much to do but it's that darn dining room table that is FULL of beads and beading stuff. I was tossing around the idea of tv trays and eating in the living room!!! But I don't think that will fly so now I have to get the beads put away so we can actually sit at the table!!! I'll be back tomorrow with something that doesn't involve Peeps!! Ok, here it is. Just as promised. I finally got them all done. I suppose I could have shown this to you when I had a couple done but then (knowing myself as well as I do) I know I wouldn't have gotten them all done. So now they are all done and I can share them with you! I do SO love the direct to rubber technique. I took my image and colored in the red and green with a marker. Then I huffed on it. The moisture in my breath was enough to keep the ink from being too dry and I stamped the image on my white card stock. I made 14 of them so it took a bit of time. When doing just a couple of anything it doesn't take long at all but when you do more than a handful it does take a while. Not that it was difficult, it was just time consuming. It was a project I wanted to do but didn't really have the time for, so I would take a few minutes here and a few there and finally they are all done! I filled some baggies with the strawberry candies and now I have a fun spring favor/gift all ready to go!! Hope this was worth the wait!! A tip on cutting the card stock for the baggies. I measure my baggie and then I cut my card stock 1/4" wider. As for the height of the card stock, well that all depends on what you want on the front. I practice mine with a piece of scrap copier paper and when I get what I like or need I then move on to the card stock. These are a lot of fun to make and honestly, they are very simple. I have been changing the size of my images to a smaller one so I hope they are loading faster for you. I HATE waiting for websites to load and anything to help out and make it quicker is always a good thing! This card was from the last DIVA swap. It was made by Amy. There is SO many things I just LOVE about this card. First of all it is made on 1/4 sheet of card stock. 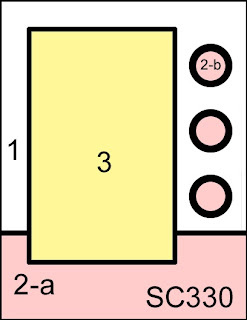 The Blushing Bride card stock on the top is 4-3/4" x 3-1/4" (4-3/4" x 6-1/2" before folding). And that piece is how you open the card. I love that layout, it's fun and different. I do have to commend Amy on all the cutting. Each one of those flowers was stamped on a different background and each one was cut out by hand. Oh and they were cut out SO perfectly too!!! I am not even sure if I ever used that flower in my set. I do know that I have not used that set much at all. I think it's time to dig it out and play with it some more! I LOVE your swap card Amy and thank you for letting me share it with everyone! The project I've been trying to finish up should be done tomorrow. I need to do laundry tonight and my workroom is next to the laundry room so I will be able to hang out and get some stuff finished up!!! I LOVE laundry day! The sad thing about this project is, it's very simple, easy and quick (if you have the time for it). I haven't had a moment to sneak away and work on it. But thanks to dirty clothes I will be finished them up tonight and I will share them with you tomorrow! PROMISE!! Ok, lets talk about my card so I can post this and finish up my project to show you tomorrow!!! Finally!!! The sketch shows two circles. I had thought about using a flower in the top circle and a Happy Birthday in the bottom one but changed it to butterflies from the "Beautiful Wings" Sizzlet. I had a bunch cut out from a different project. I needed the very tiny butterfly which left me with all the other sizes. I put them in an empty brads container and saved them for another day. Well, today turned out to be that "other day!" Saving these things helps to put a different card together quickly! Not that the butterflies are difficult to cut out but I didn't have to get some card stock, get out the Sizzlet, run it through my Big Kick and repeat for the two butterflies I needed. I just opened up the container and it was half full of these white butterflies. Can't ask for more than that now can you? For the #3 spot on the sketch I used ribbon instead of card stock. Though I had thought about using the ribbon punch to make that piece but I wanted a knotted bow on the card to fill in some of that open space. And last but not least my wording is from the "Well Scripted" set which I believe may be retired or is in limbo until the new catalog comes out in a few short months! I like the set so I'll be hanging onto it for a while longer! If you have time, give this sketch a try. It's a lot of fun. There is so much you can do with this layout! One of my fellow DIVA's, Julianne made this card. The theme for this swap was to either make a gift card holder card or a flower card. I LOVE how the bleaching turned out on here. With the bleaching technique you never really know what you are going to get. Some papers you use will bleach differently than others. I had black card stock bleach and leave an orange color behind. It was great if you were making a moon! You do have to be careful when doing this so you only get bleach on the things you want it on though! I do love the look of this technique but I do find it dries out the rubber on my stamps. It makes the rubber seem a lot more firm. So what I do is when I am done stamping with it, I was the bleach off with soap and water. Then I ink up the stamp with VersaMark. The glycerin in the VersaMark helps to rehydrate that rubber. I like to leave it on there overnight and then I wash it off with soap and water and the stamp is as good as new! One more thing to remember with the bleaching technique, always clean the stamp off immediately after you are done with it. Never leave it set overnight. There, now you got a fun technique to play with and some tips on what to do to take care of your stamps after! Thank you Juliann for letting me share your beautiful card with everyone! Nothing like a little green frog to brighten up your spring. Spring! What a strange word that is around here!!! It pops it's head in once and a while and then it snows again or gets cold. But I know this won't last forever so I just get my indoor stuff done so I can spend some time outside this spring and summer planting and keeping up the lawn. I'm not a big fan of summer but I do enjoy the other three seasons. Especially spring, if it ever officially arrives that is!! OK, onto my card. I used the "A Flower for All Seasons" set. I used the one with the daisies and the frog. I suppose that would be more of a summer one since the other one with the tulips is more of a spring image. Oh well, I chose this one and I like the colors. I colored it in with Marina Mist, Daffodil Delight and Wild Wasabi. SO why not use those colors of card stock then too! It all tied in together nicely. And it was a fun and bubbly layout too! This is a card that can be used for numerous occasions. I think I will be using it for a birthday card! I have a few more birthdays coming up and need cards. I am working on a "Weekend Project" and will be (hopefully) finishing it up tomorrow night. It's not a difficult project at all, it's just that I'm making a bunch of them and I know if I post one on here without the others not being done I will drag my feet on finishing the project up. SO, my motivation is to get them all done so I can post it on here to share with you! Isn't it just amazing how much fun you can have with a few die cuts and a rubber stamp? A while back I had been cutting out flowers for a different project and I had cut one of those big sunflowers in half. I thought how fun it would be to put it on a card sort of popping out from the back of something. And I put that idea aside until today! I die cut the yellow flower and I cut it in half. I taped the two halves together. I added a circle in the center and then wasn't sure where I was going to go with it. Did I want an image or did I want words? If I used an image would it distract from the sun? SO I decided to go with words. Then the issue of what size wording. I wanted something long so I checked what I had for words and found that the happy birthday from the "Curly Cute" set was perfect for this. I set it on the card and set the sunflower behind it and was liking what I saw. But it still needed something. And that is where the butterflies came into play! I added some pearls on the butterflies and the center of the sunflower and it was just enough! It was a fun and quick birthday card to make! I had purchased the "Circle Circus" stamp set a long time ago and had never used it. I would look at it when I wanted to make a card but other sets would stand out more so I would set it aside. Well, today I decide NOT to set it aside and to actually use it before it retires! I decided to use the "One Sheet Wonder" technique with this set. That is where you fill up an entire sheet with the images (like I did here) and then cut pieces off it as you need them. What a lot of fun this card was. I didn't fill up a full sheet. I used a 1/4 sheet of card stock for my stamping. I will be able to make two or three different cards from just that little piece. Today I made one! The words came from the "Word Play" set. And I added the orange button to the corner. I did use a 3/4" punched out white circle under the button so it would show up better. 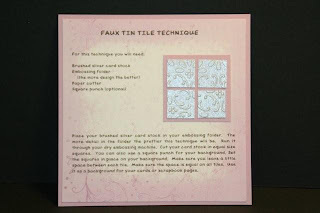 Before I taped the pieces in place I did use the "Lattice" embossing folder on the front of the card. I tied a ribbon around the top part and the card was done! Such a quick and simple card to make. I also thought it would be a great card for birthdays, especially for teens because of the fun colors! A very quick and easy card to do. I didn't make a sample with this technique. I had run out of the brushed silver card stock. I'll give it a try some other time and link it back to this technique page. This is a very simple yet beautiful technique to do. All you do is find an embossing folder that has lots of design to it. You can use ones with less but you don't get the full effect of the tin tile look. The tin tile is a very old form of wall and ceiling (yes, ceiling) covering. I could see a few feet of squares of those tin tiles on a wall but not the whole wall and definitely not on my ceiling. Anyway, it lead the way for this faux technique! Once your brushed silver card stock is textured you cut it into squares. You can also use a square punch for this too. 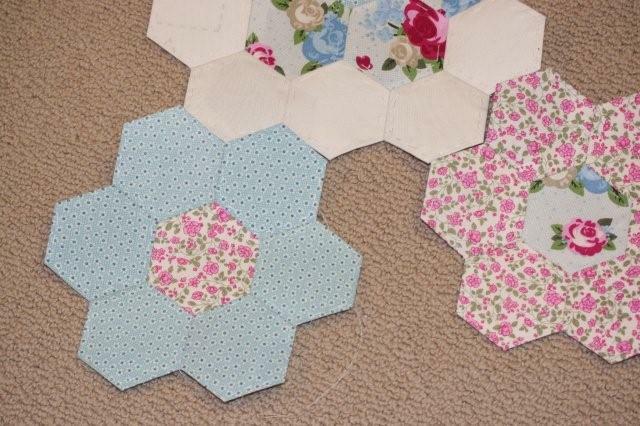 Next you set them in place on your card stock making sure you leave an equal amount of space around each square. See, I told you it was easy. And LOTS of fun too! Now go try it! This is one of my most favorite card layouts. I have used it on SO many cards. I especially like it because I can use tiny stamps as a focal point of the card. This tiny stamp is actually an incentive stamp. I had it for a while but have never used it. And with this new "Nautical Expedition" paper pack it was the perfect stamp to use with this card layout! And this is another fun masculine card too! Since there are no words on this card it can be used for several occasions such as Father's Day, masculine Birthday, masculine Get Well and even a masculine Sympathy card. 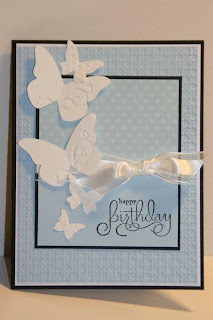 This is a very fun card to make and I really liked it with this tiny stamp and those fun papers! Talk about a SUPER easy, fun and quick card!!! I ordered the new "Flower Garden" Embossing folder that will be available on May 1st in the new spring mini catalog. The image is actually another inch or so longer but I had to cut some off for the orientation of my card. I embossed it and then found a piece of decorative paper that I liked, which happened to be from the "Paisley Petals" pack. The base of my card is a half sheet of Old Olive folded in half. On top of that is a piece of Cherry Cobbler cut 4-1/8" x 5-3/8". On top of that is the white embossed layer which was cut 4" x 5-1/4". The rectangle layer was cut 2-1/4" x 3-1/2" to fit the piece of decorative paper that I had cut from a previous project. That piece measured 2-1/8" x 3-3/". I tied a piece of Old Olive grosgrain ribbon around it and taped it in place on top of the card. Next I punched out the scalloped circle using Old Olive card stock. Then on top of that I punched out a 1-3/8" circle of Cherry Cobbler and the 1-1/4" "Happy Birthday" was from my stash of words I had cut out a while back. I actually think I am caught up on birthday cards for the month!!! Whoo hoo!!! So if you need a quick, easy and fun card, this is the way to go!! I actually bought the "Nautical Expedition" decorative paper along with the download. Now I can see that my printer does print it out in a different color. Fortunately I like how both look!! But on my card I used the decorative paper that was manufactured. The stamp is from the new spring mini catalog which starts May 1st. And the words are from my stash I printed out a while back. It's just SO convenient to print them out, punch them out (in round and oval) and keep them in an envelope for future use! This was a very fun sketch. If you have time give it a try! I printed the sketch out and now I need to trim the edges so it fits in my photo album where I keep them all. Yup, all of them! All 328 of them!! I refer to them often too. I like to take the stamp I want to use and set it on top of the focal layers of the sketches to see which one it will work best with. It sure makes card making a lot easier! To do this technique all you do is ink up one side of your embossing folder, add your card stock and run it through your machine. As simple as that. The ink washes off easily. If you use the craft ink it may take some soap with the water but it does come off. It's such a pretty background effect. I used the "Flower Fancy" set to make this card. And the words are from the "Word Play" set. It was such a fun card to make. I was just in awe with how the technique turned out! I'm almost done with the technique pages set #4! They will be for sale as soon as the last set is made. I know some of you are sitting on pins and needles waiting for me. But it's coming along!! Be patient! Sorry this card is so dark. I had been messing with the settings on my camera and forgot to set them back. If you click on the photo you can see it a bit closer and brighter. I took out my Hostess Level 1 "Because I Care" set. I wanted a pretty flower for the front of a birthday card I needed to make. This was an extremely easy card to make. I used the "Direct to Rubber" technique on the flower with Always Artichoke, Marina Mist and Pacific Point markers. I colored the leaves in with the Always Artichoke. Then I colored in the whole flower with Marina Mist. And then I used the "Thumping Technique" on the flower with the Pacific Point marker. That technique is when you take the marker and hold it toward the opposite end and tap it on your image. The image picks up bits of that color in a more random way then if you were to pick spots to color in. This flower was perfect for that technique. The words are from my computer. I printed out a full sheet of them and use them as I need them! This was a fun and very quick card to make! This card was made by a fellow demonstrator Amy. I ran across it the other day and realized I hadn't shared it with you. I LOVE how she punched out all those cute cherries to put in the "basket". That set and the punch are on the top of my favorite things to play with when I stamp. I LOVE stamps and punches that go together. The less cutting out I have to do the more I will use the images and punches. Though I have been known to cut out a lot of flowers. I guess if you really like what you are doing, all the cutting doesn't matter, much!! I whine about cutting out flowers and stuff but the end results do make it all worthwhile. Thank you very much Amy for letting me share your wonderful card with everyone! OK, this is the last "The Open Sea" card I will be making for a little while. I SO love this set. Well, the digi set that is. My clear mount set will be arriving next week. I will try to refrain from playing with it for a week or so. But it's SO hard not to. As I was setting this card up to take a photo, I was admiring how crisp every line of the image is. Well, of course it would be crisp, it wasn't inked up and stamped. Sometimes not all of the details come out when you stamp and it's ok, it's part of the art of stamping. Though being the perfectionist that I am I do like to see a perfect image. Anyway, what I saw in this ship was a fun idea. I thought it would be fun to print out a bunch of them at 50% opacity and make a notepad with the images. I'll be giving that a try but not right now. I'll give the image a break for a little while. And don't you just LOVE these papers too? I used the "Nautical Expedition" Designer Series paper downloads #3 and #4. I think these knots on the paper are FABULOUS!!! What I did was I printed out a whole sheet of each on 30# copier and cut off what I needed. Just like you would do with the original paper from the pack. I printed out the ship but this time I made it smaller. It is still a bit larger than the image in the mini but that's ok, I wanted it bigger for this card. And the "Happy Father's Day" came from the "All Holidays" set. That image is much smaller than the one in the catalog (or the original image). I wanted it smaller to fit this card. I can't wait for my order to come. As I look at this I can see that the "Happy Father's Day" image would be SO cute if it were punched out with the new "Postage Stamp" punch! The image would have to be made even smaller for it to fit in the punch. Anyway, there's lots of fun stuff coming up so I'm pretty sure I can leave this ship set behind for a bit and play with something else!!! Thanks for putting up with me today! I wanted to make a very clean and simple birthday card. Well, I still had "The Open Sea" download open on my computer. SO why not print out one more before I move on to something else?? I don't want you to get sick of seeing this image! And let me tell you. It doesn't get any simpler than this. OK it would if someone else did it for you!!! I just printed out the ship on 30# copier paper using Night of Navy color and the words came from the "On Your Birthday" set. I did have to physically stamp them. And the background is from the "Nautical Expedition" download. I'm SO glad I bought that download. I like every background paper in the set. That for me is very unusual. There is so often a piece or two in a pack that I don't care for or I have a lot of trouble working with. But this pack is fabulous. I love the images and the colors they come in. You can't change the color of the background pages with the download but you can change the opacity level of it. On the card I did yesterday I changed the opacity level to 50%. That made my background 50% lighter than normal. It was much like the technique "stamping off." This card was fun because I got to combine digital images with regular stamping. The best of both worlds!! Now I have another masculine card for my stash. Though it's not much of a stash when you need them and use them. I am thinking about putting together a little pack of cards to give away as blog candy! I'll probably do it next week. This week is pretty full and I just can't squeeze another thing in! SO stay tuned! I still have my program open and am continuing to play with this fun download. I can't wait for the set to arrive either. I didn't order the decorative papers but I did purchase the download so I can print out the papers as I need them, just like I did for this card! Ok, lets talk about my card and this weeks Sketch Challenge. As you can see by the sketch that I turned it to accommodate the ship. And once again I printed the ship out to fit the size of the card. When I do this I set my printer to a fast or draft print so it uses very little ink. That way I can print out a few copies until I get it the size I need. It only took me 2 tries to get it right and I printed and adjusted the anchor at the same time. My background papers are from the "Nautical expedition" download too. It's a great way to get the papers and never have to worry about running out. And as I have said before, print the final copy out on at least 28# paper. I usually use the 28# but prefer 30#. It has the feel of the decorative papers. But I only print on one side. You could print on the other side with the heaver paper, that is what it's designed for. I did cut out the anchor by hand. I know, I do need to get a life!! LOL I had to use an x-acto blade to cut out between the anchor and rope and at the top of the anchor. I didn't want to leave it white and as I look at it I'm glad I did take the time to cut it out like that. I am not too sure I like the color of it but I wasn't about to cut out another one!! I can assure you I won't be making this card for any swaps. Not with an anchor on them anyway!! Another fun sketch and another masculine card to add to my stash! I just don't seem to have enough of them. I thought it was time for a "weekend project." There are 150 of them on y blog and you can view them by clicking here. For this one I thought I would use the Sixxiz "Milk Carton" die. It is one of my most favorite dies. I LOVE making milk bath but I hated cutting and scoring the card stock for my own milk cartons. This die sure saves a lot of time. Plus it's a bit smaller than the ones I was making so I can save money on the contents too!! When I made this one I took a piece of clear acetate and cut out the milk carton. Then I ran it through an embossing folder to add a bit more texture to the carton. Once I found the score lines I did re-score them with a ruler and my stylus. I held the top together with a ribbon. I took my Crop-a-dial and punched the holes, threaded the ribbon and tied it in a bow. I added my egg though the bottom. I did make a little stand for the egg by cutting a piece of acetate 1/4" larger than the base of the carton. I scored all four sides at 1/8" and I tried to punch a hole in it but the circle punch just didn't want to punch through all the way. But it did punch through some so I was able to get my scissors in it and cut the rest. I folded the score lines and I set the egg on it. Then I set the egg inside. I taped the bottom flap only using the Stick Strip tape. You need something strong to hold acetate shut. It is what I used on the side to hold the carton together. On the bottom I added a piece of Certainly Celery card stock that I punched with the "Eyelet Border" punch. I did run my card stock through my Xyron machine so it was sticky on the back before I punched it out. I then removed the protective layer and stuck the piece to the milk carton. You can achieve this using the Sticky Strip tape but you have to be careful that you get it straight and don't cover the eyelets. I stamped "Happy Easter" from the "Teeny Tiny Wishes" set and punched it out using the "Word Window "punch. I used a piece of Sticky Strip and taped it in place just under the bow. The egg didn't want to stay in place so I had to juggle it around a bit so it was back where I wanted it. Silly little egg!!! I find it a challenge to make these milk cartons with the acetate. It is difficult to see the score lines and it's more difficult to put together than it is with card stock. But it's such a pretty effect that I just couldn't help myself!! Today I was playing with my newest Sizzix die "Fun Flowers." I've had it for a few weeks but have not had a chance to play with it. It was fun to just run a few pieces of card stock through the Big Kick using this die and be able to quickly create a fun flower. What is great about this die is there are several sizes of flowers on it so you can use them all in one flower or make smaller flowers. Another versatile die! And you know how much I LOVE versatility in a stamp set and dies! All I did was sponge the edges and the flower was ready to put together. The words are from the "Teeny Tiny Wishes" set and I punched them out with the "Word Window" punch. Such a quick and fun card to make! This is the first time I've used the "Animal Stories" set. Shocking, isn't it? It's so sad. I wanted this set because I thought it was so cute and there it just sits on my ledge waiting to be used and put on the shelf with the other cataloged stamps. Anyway, I used this set to make my card that I used the Bargello Technique on. The words are done on my computer and they were set in place with Dimensionals. It's a fun and easy technique and if using just card stock you can get rid of a lot of scraps that way too. For mine I used a piece of decorative paper from the "Blueberry Crisp" pack. I cut the card stock across the printed lines. I didn't want to cut it along with the lines, then I wouldn't get a good mix when I attached them. I took a piece of card stock and put my mono tape on it, the entire thing. Then after I got done cutting my strips in various widths I just stuck them on the card stock. I started at the bottom and worked my way to the top. Once my first strip was in place I took the second strip and hovered over the first strip with it so I could match up one piece of the design. 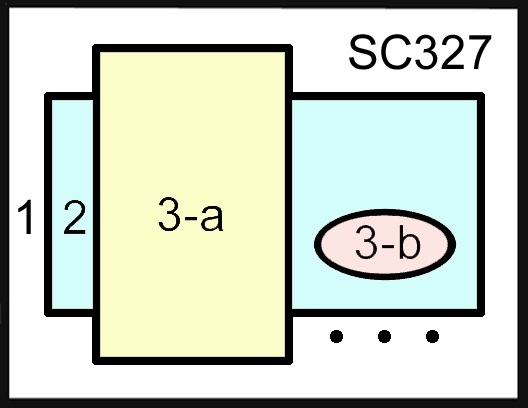 Then on the second strip I moved the it to the right or to the left of the design piece and set it in place. I did this for a few strips going in one direction, then I changed it for a few more strips and it created a "V" look or a wavy look. Click on my photo for a closer view of the decorative paper. You just keep repeating this "V" or wave until you have our piece of card stock all covered. 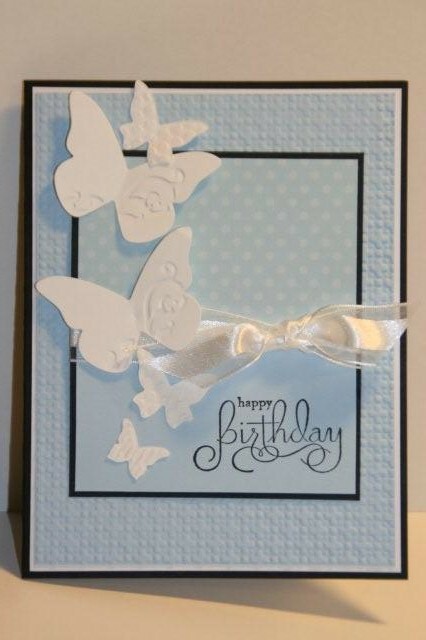 Trim the edges and it's all set to be used in the background of your card. It's easy and fun too. Plus it adds a wonderful background to your cards. 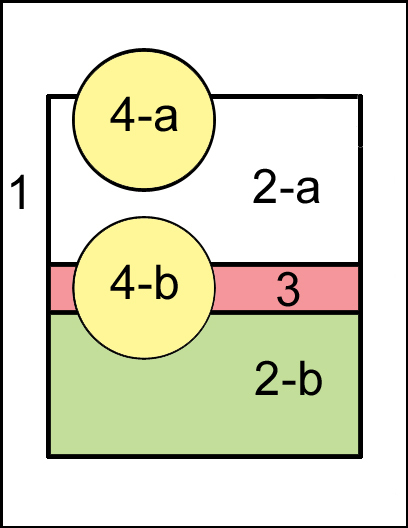 A technique page was made using this technique. I have a few more to do and set #4 will be ready. You can purchase sets 1 - 3 in my web store on CD. The are designed to be printed out, two edges trimmed and are ready to decorate. A photo of each technique page is included on the CD too. 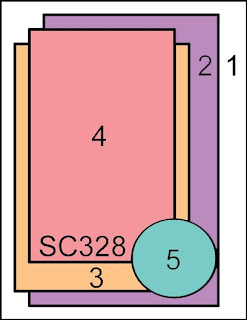 They are great for setting up a technique club or just to print out and make for yourself for personal reference.